As a restaurant pitched to today’s typical Manhattan diner, the Grill is “almost too perfect,” said Ryan Sutton in Eater.com. 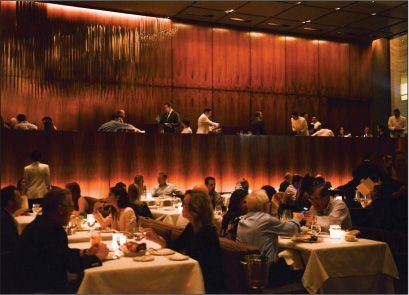 Occupying an iconic modernist space— the Philip Johnson–designed room in the former Four Seasons restaurant where the power lunch was born—the four-monthold Grill would be “easy to dismiss” as a pricey indulgence in mere nostalgia if the food weren’t so outstanding. Richard Torrisi and Mario Carbone, who proved how tasty nostalgia can be at Parm and other downtown ventures, have created a menu that references 1959, when the Four Seasons began its run as the most important American restaurant of the 20th century. But the prime rib, the $98 caviar vichyssoise, and even the mushroom omelet are all “spectacular,” while the reimagined Amish ham steak could double as “the city’s best pork chop.” The room, after a multimillion-dollar renovation, looks as gorgeous as it did when JFK was president—all contributing to the only four-star à la carte experience you can find in 2017 New York City. It’s “a theme restaurant for the wealthy,” but “one that puts everyone under a spell that they belong.” 99 E. 52nd St.
Acacia House St. Helena, Calif.